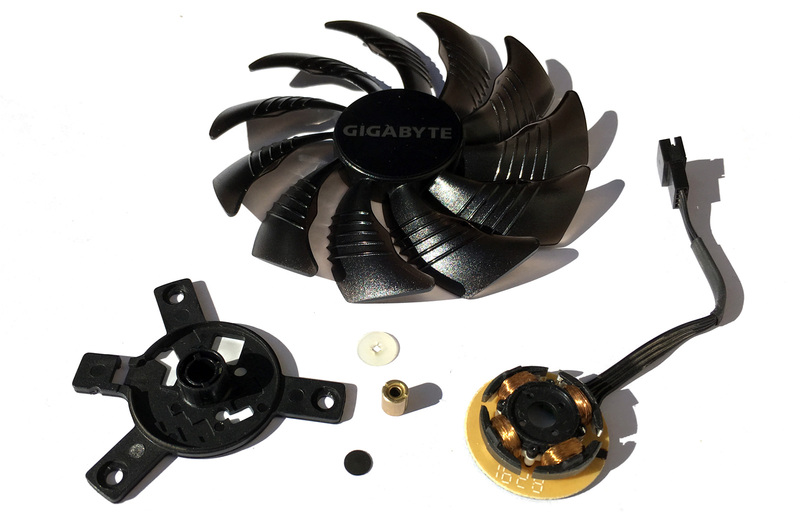 We have recently talked about how you can Fix problematic fans of Gigabyte Windforce VGAs as the company tends to use cheaper sleeve bearing fans that are more prone to failure when used for GPU mining rigs. Interestingly enough Gigabyte does seem to use multiple suppliers for their Windforce fans and even though on the top the blades of the fans are the same, inside there could be interesting differences. 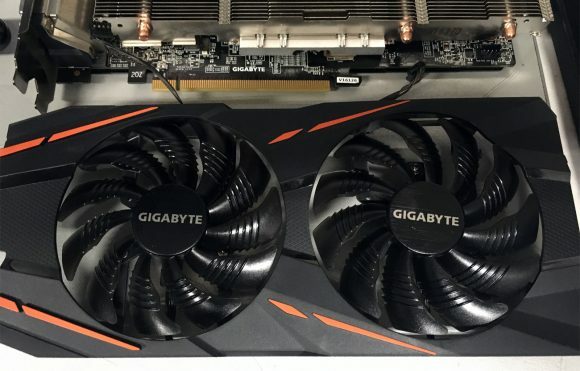 So far most of the RX 400/500 series of GPUs from Gigabyte with Windforce fans that we’ve seen used 2x5x5.5mm metal bushings inside and as we have already mentioned these are easily replaced with readily available ball bearings and you can upgrade your fans to be more durable long term. It is a well known facts that sleeve bearings are much less resistant to higher temperatures and dust than ball bearing fans and as the operating conditions worsen their life span drops significantly. 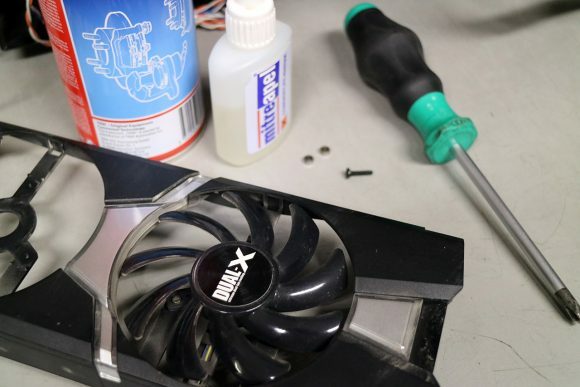 Some of you might remember our guide from last year on How to Maintain and Repair Dual-X and Other Non-Serviceable GPU Fans covering the whole procedure on how you can fix the fans of old mining video cards that use cheaper sleeve bearing fans. That guide was demonstrating the whole procedure for Sapphire’s old Radeon Dual-X video cards that were very popular back in the Litecoin mining days and are still usable for mining ZEC for example or any other Equihash-based altcoin. Back then we mentioned that the same procedure works for Gigabyte’s Windforce fans as well as many other cheaper fans that find their way on a lot of video cards nowadays, even on very high-end products such as even GTX 1080 Ti. 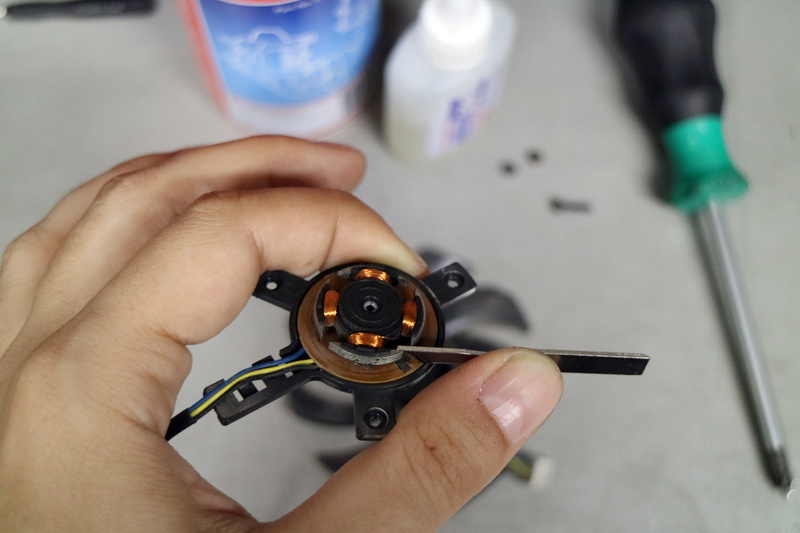 The basic procedure fro replacing the metal bushing with ball bearings is pretty much the same on all fans, though there are some specifics from brand to brand and from model to model and now it is time to talk a bit more about Gigabyte’s Windforce fans. Gigabyte has been using the Winforce series of fans for quite some time and they have never been our favorites, especially for GPU mining rigs due to the fact that they are essentially cheap sleeve bearing fans that are less durable when used in higher temperature and dusty environment. The high temperature and dust are the two very common things for many GPU mining rigs and Gigabyte even used the same fans on their Nvidia P106-based mining GPU and we have recently checked what is the situation in just a bit short of three months of use for mining with these. We even had bad experience with Windforce fans starting to fail in just about a month of use on RX 400/500 series of GPUs as well as on GTX 1070 when used for mining, so you can imagine why video cards from Gigabyte with these fans are really not our first choice for GPU mining rigs. With all of the above said however there is one important advantage that Gigabyte’s Windforce fans have over some other cheaper sleeve bearing fans found on expensive video cards used for mining and that is the fact that you can relatively easily upgrade them. We are talking about replacing the metal bushing with dual ball bearings thus fixing fans that are starting to show signs of the metal bushing wearing off and the fan destabilizing or the fan rotating slower due to dust buildup. The important thing here is to catch the potential problem on time and fix it promptly and not wait for the fan to stop rotating completely and then start to think about a solution as then it will be most likely too late to do anything. Sure, with fans starting to fail in a month or just a couple of months since purchase of a new GPU you can get a warranty replacement, but when used for mining this means downtime and the newly replaced card can start showing problems soon as well… imagine if you have tens or hundreds of Gigabyte Windforce, Gigabyte Gaming and even some Gigabyte Aorus cards that do come equipped with the cheap sleeve bearing Windforce fans. The metal bushing used by the Gigabyte Windforce fans is 2x5x5.5mm in size (2mm inside diameter, 5mm outside diameter and 5.5mm height) and you can easily find the right size of ball bearings for these sizes. You will need two 2x5x2.5mm bearings as well as a single spacer with at least 2mm inside diameter and 5mm outside that has a thickness of 0.3-0.5mm that you need to place between the two bearings. If you do that you will get a perfect replacement of the standard metal bushing essentially upgrading the fan to dual ball bearing one and getting it to be like a brand new one or even better. The dual ball bearing upgrade will make it more durable and resistant do higher operating temperatures and dust and you will have more problem free time for mining without issues with the fans. The only drawback is that the upgrade procedure can or will void your warranty, unless of course you do the procedure carefully and save the metal bushings to reinsert them back should you need to return the video card for replacement due to an issue with the board itself and not the fans. There are a lot of people that use various GPUs for mining with the stock fans that the video card comes with and normally many of these fans start to have issues in just a couple of months or after a year or so. The time frame usually depends on how clean is the environment that the mining rigs are at and how well maintained are the rigs themselves. 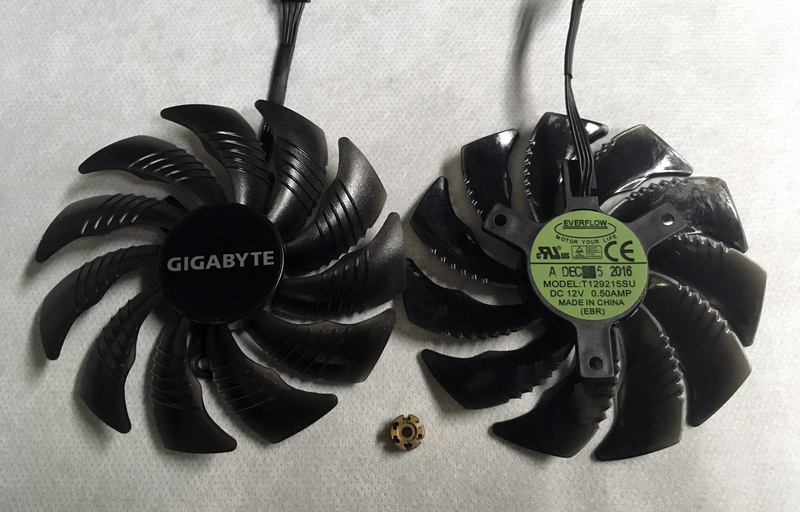 Sooner or later it is inevitable for the fans to start behaving worse than they were initially, because of the dirt they accumulate that slowly eats away the brass or bronze bushings of the non-serviceable cheap fans that most video cards use. By non-serviceable fans we mean these where you have no access to the mechanical parts of the fan when you remove the sticker of the fan. 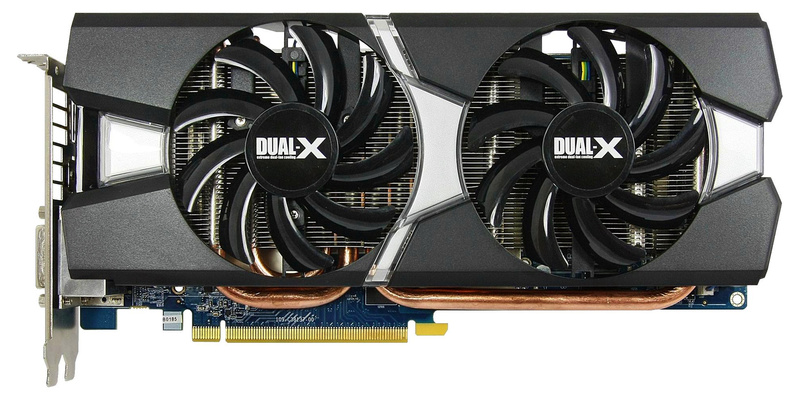 One of the most famous and widely used such fans are the ones used on Sapphire Dual-X cards, but there are others such as Gigabyte’s Windforce and so on. The good thing is that these cheaper fans can actually be kept in good shape as well if you know how properly disassemble them to clean them on a more regular basis. Even if you have missed the point where the fans could be kept in top shape by cleaning them regularly and have instead started breaking down, there is still a chance that you can bring them back to life as long as they have not stopped completely rotating. We have prepared a guide on how you can completely disassemble a non-serviceable fan from a Sapphire 280X, clean it up and assemble it or repair it with the help of some new bearings that you are going to be using to repair the fan making it like new. Although this guide is specifically for Sapphire’s Dual-X fans, it should be pretty much the same for many other similar fans. 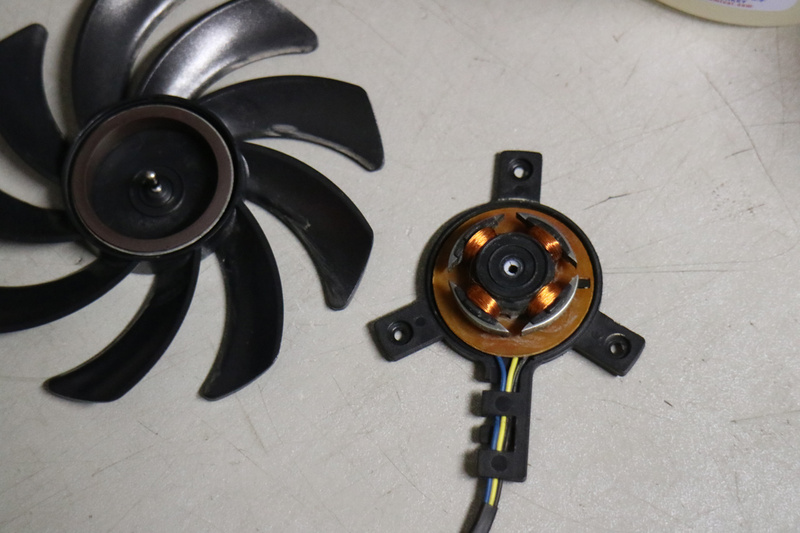 For comparison the turbine type coolers used on most cards, although noisier, are much higher grade and more expensive fans that can last much much longer without any attention from the user. Depending on if you just want to clean the fans or to repair them and make them more durable you may need a different set of tools. For the first you can go with just a spray can with cleaning fluid, but for proper repair and upgrade a few more tools will be required. You will need a spray with cleaning fluid to make cleaning easier, we are using TRW brake cleaner, but anything else that is not too aggressive to plastics should be fine. You can also use alcohol-based cleaner that is not under pressure to clean the parts of the fan as well, so pretty much anything will do here. You will also need a philips and a flat screwdriver, some cyanoacrylate adhesive, a small wood screw (or a larger one for plastics) and a pair of bearings with size 2x5x2.5mm in size (this is the correct size for Dual-X fans, some other fans may require different size of bearings). This is all you will need to prepare along with some patience and a few spare fans that you may initially break until you get the hang of things if you are not careful enough. You need to detach the fans from the faceplate holding them, usually they are held by three screws each and then comes the first step in disassembling the non-serviceable fans. 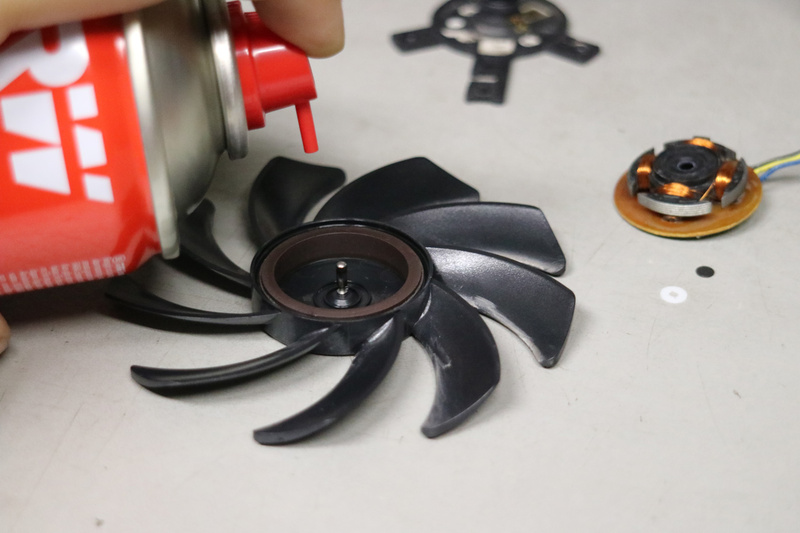 You need to carefully remove the top rotating part of the fan with the blades. 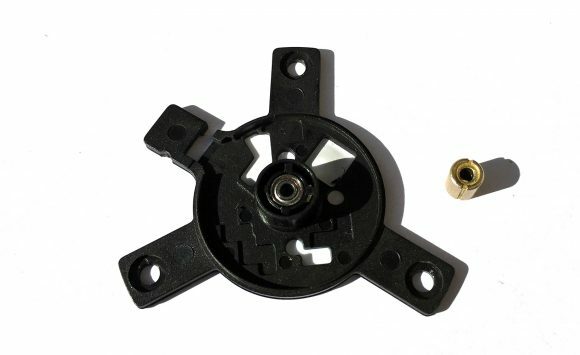 The top part of the fan contains not only the blades, but it is also essentially the rotor part of the brushless motor while the lower part contains the stator of the brushless motor that rotates the fan. 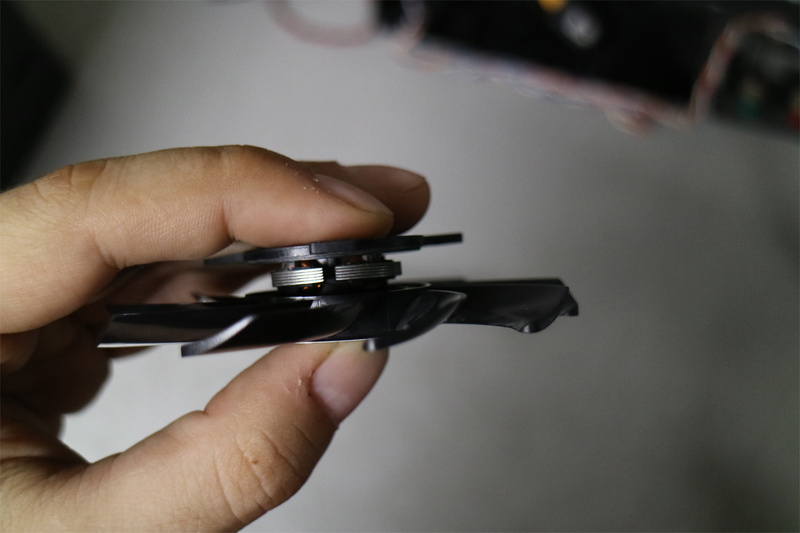 You need to separate the two parts carefully by using three or four of your fingers to push in between the two parts (some fans come of easily than others). The important thing here is not to pull the blades of the fan and they can easily break, you just need to apply enough force with your fingers in between the two parts of the fan and you will get the desired result of the two parts separating. Gigabyte’s Windforce fans for example do require more force to come off as apparently they have a stronger plastic locking ring. 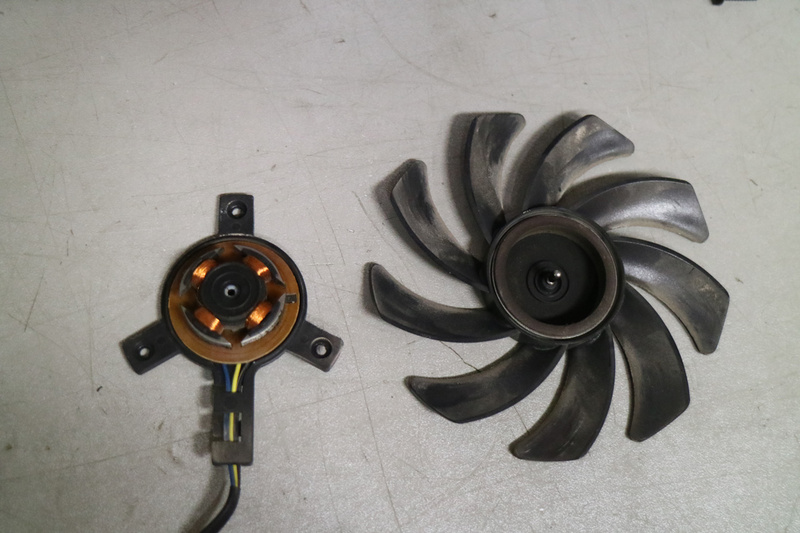 Here are the two parts of the fan disassembled, this is essentially half of the hard part already done. At this point you can just use some cleaning spray to clean up the two parts of the fan, apply some grease on the steel shaft and reassemble the fans. This would be enough to extend the lifetime of the fan significantly if you do this maintenance once every few months of operation. You just need to make sure you use a pressurized cleaning fluid that will take out all of the dirt away from the lower part of the fan as it is harder to clean than the upper part. If you are doing only the cleaning part you can just push the two parts back together and everything should be fine for a couple of more months when it would be a good idea to repeat the cleaning process again. 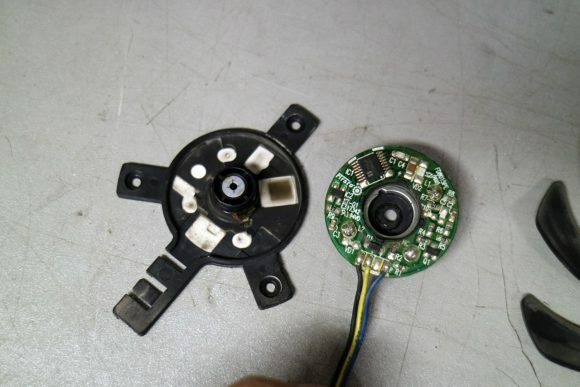 For the people that want to repair and upgrade their fans with dual ball bearings thus extending their lifecycle significantly you will need to continue with the disassembling part. You need to use the flat screwdriver or a flat tool that you need to insert between two of the poles of the stator and gently apply pressure. Do not push too hard, if you do not feel the stator with the PCB below moving a bit, then just move to the next pole and apply some more pressure. 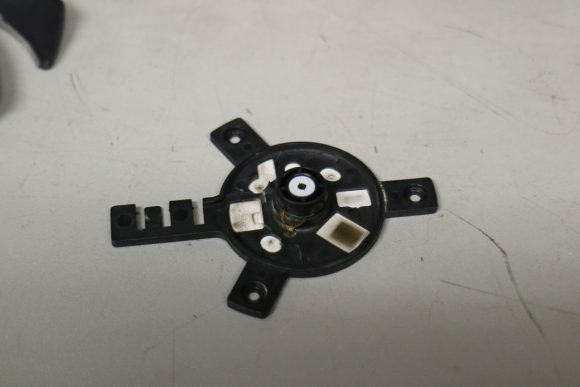 This is needed, because the PCB with the electronics and the stator of the motor that is on top is glued to the plastic bottom part of the fan and you need to break the glue. Be very careful not to press on the thing copper wire sued for the windings as this may damage the motor, also too much pressure may break the stator away from the PCB, so you need to be extra careful here. There is just a drop of glue, so once you feel the part rotate a bit you should be able to separate the PCB with the electronics from the plastics pretty easy. Here are the parts separated. 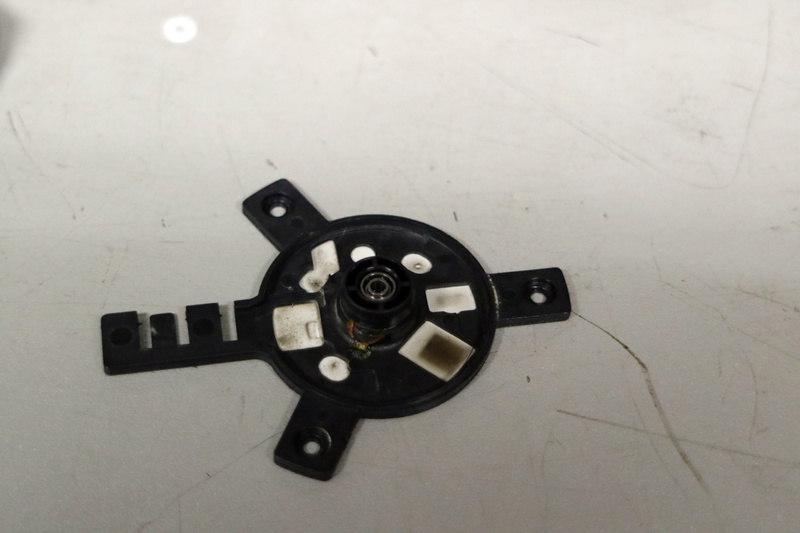 As you can see the bottom plastic part contains the metal bushing (sleeve bearing fans) and on top of it is the plastic holder ring that locks into place the top part of the fan. 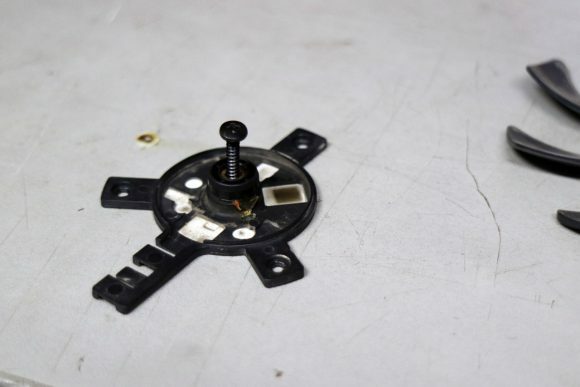 The PCB and the stator of the motor show traces of some grease and dust accumulated on it. You need to remove the plastic holder ring and be careful not to loose it and under it is the metal bushing that you need to pull out and replace with the two bearings turning your cheaper sleeve bearing fan into the usually more expensive dual ball bearing fan that provides longer lifespan and reliability. 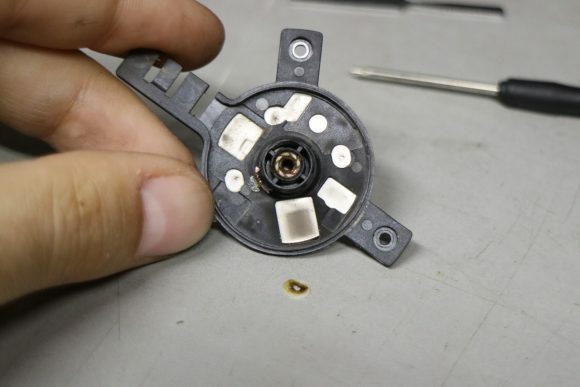 As you can see when you remove the plastic holder ring there is a lot of dirt inside, this is the thing that essentially kills the fan because it eats away the bushing unevenly and destabilizes the rotating part of the fan. You need to turn the screw inside the metal bushing with the help of a screwdriver, again be careful here, because as soon as you feel that the screw is not rotating, but instead the whole bushing is you will need to pull out the screw with the bushing attached to it. Be careful after removing the metal bushing, because under it should be a small black disc that is easy to get lost and you will need to put it back in when you clean everything up. Clean everything well from the dust and dirt and make sure not to loose any of the small parts and then you will be ready to start assembling back things. 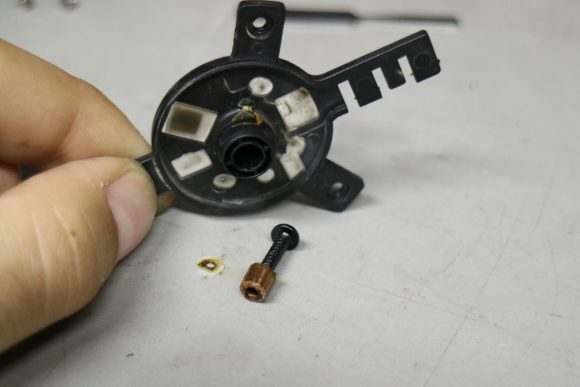 The difference is that instead of returning the metal bushing back you will be inserting the ball bearings inside the plastic bottom of the fan. Start by placing the small black disc inside the bottom plastic part, make sure it is seated well on the bottom before you start inserting the ball bearings. The two 2x5x2.5mm ball bearings should fit tight inside where the original metal bushing was, just push them carefully to get inside and place the plastic ring holder on top. 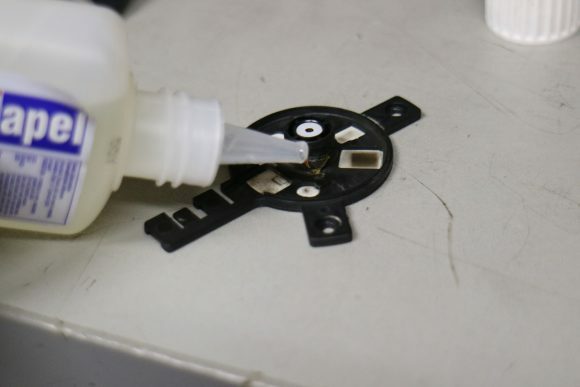 Apply a small drop of cyanoacrylate adhesive on the spot where the original glue was placed and quickly place the PCB with the electronics and the stator of the motor back on top of the plastic lower part. You can use the fan cables as a guiding point in order to properly orient the two parts, so that there will be no issues gluing them together properly. What you should be extra careful about while gluing the two parts is not to rotate the bottom too much as the white plastic ring can move around and while pressing the two parts together. Make sure it stays on its original position centered above the bearings as otherwise you may have to remove the two parts and try to glue them again after reseating the plastic ring. Wait a couple of minutes for the glue to cure and you are ready to assemble back the two parts of the fan together. Just hold them parallel to each other and gently press them until you hear a click sound. This would mean that the plastic holder ring has moved to its place and has locked onto the steel shaft of the rotor (the top part of the fan). After that you can reassemble the fan on the video card and connect it to the power in order to test that everything is working properly and it should. As a result of replacing the stock metal bushing with two ball bearings you should have the fans rotating just like brand new with a little less effort and with an extended lifespan that the bearings should offer. What you have essentially done is to upgrade your cheap sleeve bearing (single metal bushing) to a higher grade dual ball bearing fan. As a result you should have less problems with fans on your GPU mining rigs, but as we’ve already explained even if you do the simpler procedure of cleaning the stock fans every few months you should still experience much less problems on the long run. We have already cleaned, repaired and upgraded quite a few of these Dual-X, Windforce and some other similar fans with great success and are really happy with the results. You can even upgrade the cheaper sleeve bearing fans of a brand new card to dual ball bearings, and that should be possible on many video cards even without causing potential problems with the warranty of the card. The reason for this is that if properly done one would have to actually completely disassemble the fan using the procedure above or a similar one in order to find out that the stock bushing was replaced with ball bearings and that normally does not happen in service centers, maybe unless of course you send in the card with fan problems.